Have you ever thought about all the ways you are blessed by being part of a family? No two families are alike, yet God ordained the family as “the most important social unit in time and eternity.”1 No matter where you live or what your family is like, the gospel can help you develop stronger relationships and spiritual strength as it brings greater happiness into your family. Read what these teens from around the world have to say about why families are important to them. Erin, from North Carolina, USA, and her family (left) have always had one goal in mind: to become an eternal family. However, Erin’s father was not a member of the Church. “Of course my mom and siblings wanted my dad to share in the blessings of the gospel. The gospel of Jesus Christ made us happy, and we wanted Dad to share in that happiness. We also all desperately wanted to be sealed together as a family,” Erin says. Determined to become a forever family, Erin and her siblings and mother did all they could to keep the commandments and develop strong faith, and they prayed together for their father’s heart to be touched by the gospel. Though it took several years, Erin’s father was finally baptized and confirmed. Ten days after his baptism, he was able to baptize Erin’s younger brother and sister. Soon their family will reach their goal of being sealed in the temple. Ever since the passing of their father, Elizabeth and her brother, Enaw, of Cameroon, Africa, have relied on their mother. “She has been a source of aid to us ever since our father died. God has blessed us and protected us in everything we do,” Elizabeth says. Elizabeth’s family (above) rallied together after the passing of her father. 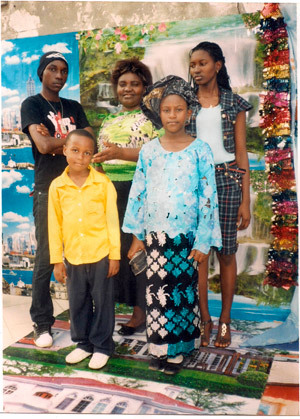 Then, after they joined the Church in 2010, Elizabeth and Enaw learned the eternal significance of the family. Adina, from Switzerland, learned how family members can help one another develop talents as they enjoy wholesome recreational activities together.2 Her family plans a monthly family outing where they learn more about each other’s hobbies. “We have the opportunity to give our siblings a deeper insight into our life and our passions,” she says. One time, her father taught the family about dog training (below). “It was nice to see his enthusiasm and how happy he was to share an important part of his life and hobby with us,” Adina remembers. Even though their reasons may be different, these teens have found that they can rely on their families for support, peace, and love. Family Guidebook (booklet, 2001), 1. See “The Family: A Proclamation to the World,” Liahona and Ensign, Nov. 2010, 129. Elder M. Russell Ballard of the Quorum of the Twelve Apostles, “That the Lost May Be Found,” Liahona and Ensign, May 2012, 98.